Texas Housewife: Don't You Just Love Potlucks? Don't You Just Love Potlucks? Potluck gatherings are something I love and pretty much a way of life here in the south. Friends and neighbors host potluck parties. Most church gatherings are potlucks, be it social events, funerals, or even at times weddings. The word potluck brings to mind good friends, good conversation, and the best food you are likely to ever eat. 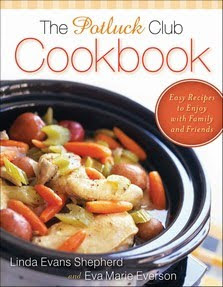 So, when I was asked to review The Potluck Club Cookbook by Eva Marie Everson and Linda Evans Shepherd, I was very excited. I cannot praise this book highly enough. It is full of tasty recipes covering what I consider potluck classics to a few new surprises. Everyone from the most experienced cook to the complete beginner will find recipes they will enjoy. I really think this one is a must have for every kitchen and will definitely keep it in mind during the upcoming holiday season. I love gifting cookbooks! The book is available September 2009 at your favorite bookseller from Revell, a division of Baker Publishing Group. Here is one of my favorite recipes in the entire book. I am sure you will enjoy it as much as my family did! Beat eggs well and set aside. In mixing bowl blend flour, salt, and sugar, then add eggs. Next add syrup and vanilla, beat until well mixed. Pour mixture into unbaked pie shell. Slice butter into thick slices and cover top of pie. Sprinkle coconut on top of pie and bake for about 1 hour in 300 degree oven or until firm and brown. I agree with the author, this truly is one of the best pies I've ever tasted. It will probably become a main stay dessert around here! This yummy recipe is just one of many greats you will find in The Potluck Club Cookbook. I am not a dessert eater but my Aunt "L" makes this at every reunion, so it must be a yummy (for some people) dessert. What a great book idea, it definitely seems like no one can ever come up with anything good (or new) to bring to a potluck! Ooo! Thanks for the recipe! I love potlucks. Our church calls them "Pot Provs" because we believe in Providence, not luck. It cracks me up!